Do you remember the first time you had a "gourmet" delicacy? I do. I was having dinner in a restaurant of supreme quality and reputation, and I ordered the escargot. It was the most wonderful entrée I have ever had the pleasure of consuming. The food there was delicious and prepared with individuality. Therein is the chief ingredient for gourmet. The definition of gourmet is a person devoted to refined sensuous enjoyment, especially good food and drink. That is the discriminating difference between McDonald's and Savoy's. Food production for the masses is a necessity. But it eliminates the wonderful, sensual, enjoyment to be had in the consumption of a gourmet meal. Having operated a restaurant for several years, I can vouch for the truth in the discriminating taste of the public. Everyone would like a gourmet meal on a shoestring budget. It is just not a possibility. If you're going to ask for sensual enjoyment, you're going to have to pay for that privilege. It's not cheap food. It was not intended to be. Gourmet food is prepared with the individual tastes and talents of a trained chef. The use of only fresh, high, quality ingredients is a must, and strict adherence to the chef's preferred seasonings required. Given all this special attention, one must assume the price to be more than $2.95. But then, I ask you, if it's gourmet, is price not irrelevant? Occasionally, we must throw aside our frugal tendencies, and simply take a moment to enjoy the fruits of our labor. The gourmet inside us all needs an opportunity now and then to experience a rare bottle of wine, the finest liver pate, or the gourmet chocolate of Godiva. That's the wonderful thing about gourmet. It's very subjective. Your tastes are not mine. There are some basics about gourmet that remain no matter what the taste of the chef or the customer. It isn't gourmet if it isn't made with quality ingredients, attention to detail, individuality, and seasonings and flavors that bring unique richness to the food. To simply include the words exotic, specialty, or rare does not make food gourmet. The experience of real gourmet is much bigger than just fancy words. Many gourmet chefs and cooks have been apprenticed or educated formally for several years. They have degrees in how to uniquely prepare your food. Or maybe the term gourmet is applied because the preparations and process have been so refined as to be considered expert in the field. This is the case with certain wine makers. The wine is considered gourmet because of the unique sensations and taste of the wine on the taster's pallet. It is beyond compare. Many gourmet chefs buy only locally grown foods. In doing so, they are adding to the uniqueness of the experience. So, as you can see, gourmet is not just a description. It is truly an experience to be enjoyed by young and old, rich and poor. Take a moment, set aside the budget and allow yourself the extreme pleasure of a gourmet meal. Ah..... the pleasures of life! 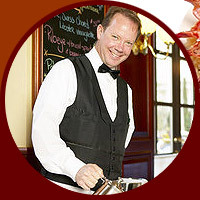 Charles Nicholson is an expert Gourmet Chef and operates a gourmet catering business. Visit http://www.gourmet-foods-and-cooking.com for great receipes and cooking ideas!